We in the Denton household LOVE cookies. They rank above almost all sweets, and chocolate chip cookies just might be number one. 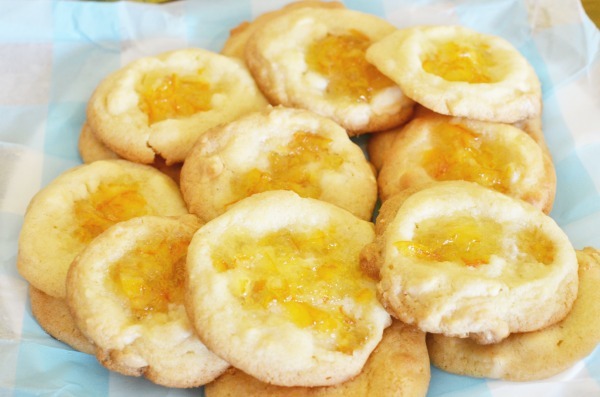 Mr. Denton’s favorites are white chocolate chip, so when I tried these cookies a couple of years ago at a friends bridal shower I couldn’t wait to try recreating them. The perfect opportunity came about when we were hosting a Paddington Bear viewing party. Orange Marmalade just screams this adorable and often sticky Peruvian bear. They paired quite nicely and got top marks with the whole family. 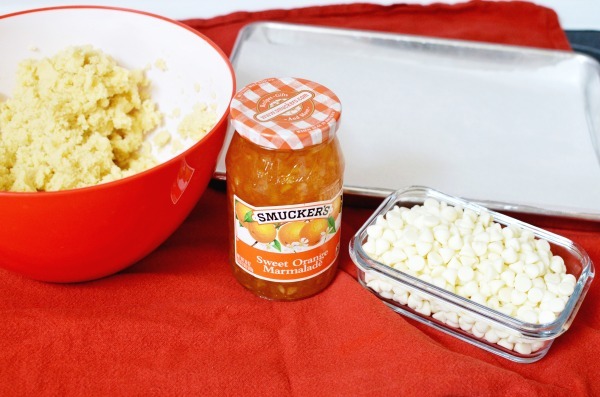 I’m sharing the full scratch recipe below, but if you are short on time you can always use a dry package of sugar cookie mix and add white chocolate chips. 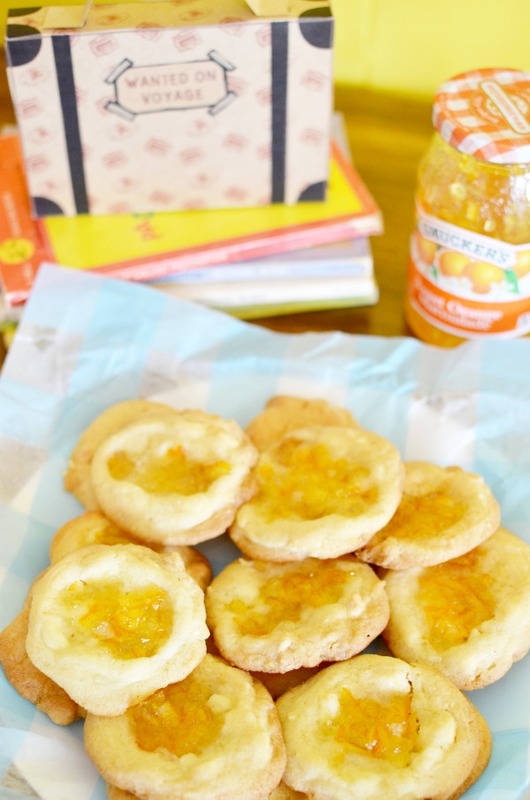 The trick to these cookies is making the perfect indent to hold the marmalade. 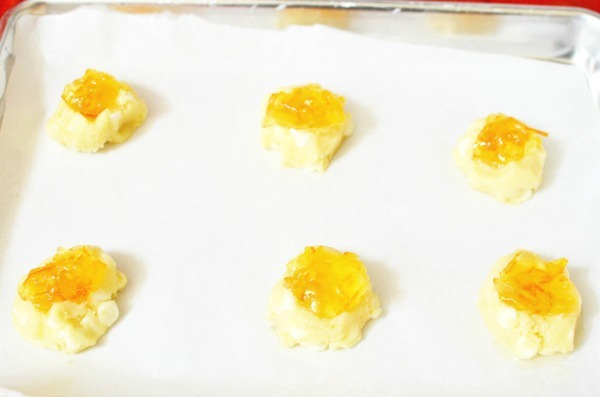 Center each thumbprint and ensure there is a nice rim to hold the marmalade and prevent spillage. Sift together dry ingredients (flour, salt, baking powder, and baking soda) in a medium bowl. In a large mixing bowl cream butter, sugar, and brown sugar. Add eggs and vanilla to creamed mixture and mix until combined. Slowly add dry ingredients with the mixer on low. Remove bowl from mixer and gently fold in white chocolate chips. 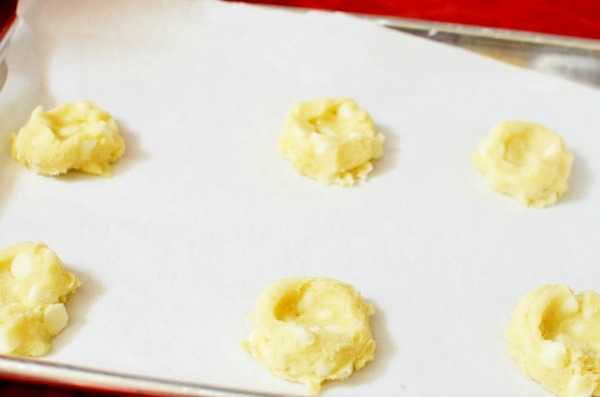 Place tablespoon sized dough balls onto a parchment lined baking sheet. With the back of a spoon or your thumb, lightly create an indent in the middle of each ball. Place a teaspoon of marmalade into each indent. Bake 8-10 minutes until the edges just start to brown. Cool on baking sheet before transfer to a wire rack to finish cooling before serving.